Facepalm: In a survey of 250 Android so-called antivirus apps, only 80 were found to block more than 30% of malware samples. Some of the apps tested didn’t even have any antivirus functionality at all. AV-Comparatives is an industry research group that rates antivirus programs on their effectiveness. 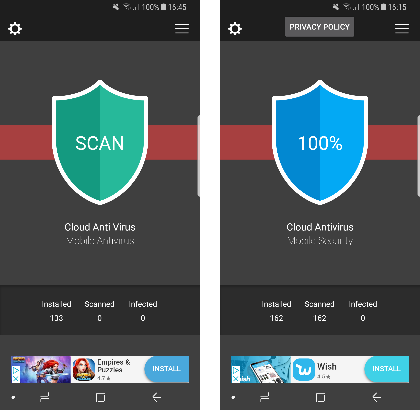 They recently conducted a study of Android antivirus products from the Google Play Store and the results were rather surprising. They tested each app with 2,000 of the most common Android malware threats and recorded which were caught and which were let through. The tests were automated, but were done on real phones rather than emulators. 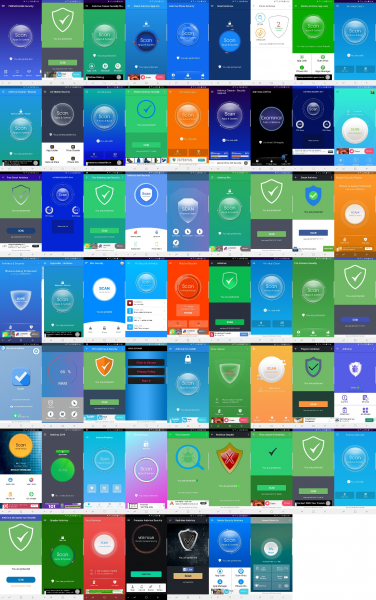 The test was designed to be easy and as a result, most of the real antivirus apps detected 100% of the samples. Overall, there were about 50 apps that scored above 90%. As a control, they also tested clean apps to see if the antivirus apps actually scanned the phone. 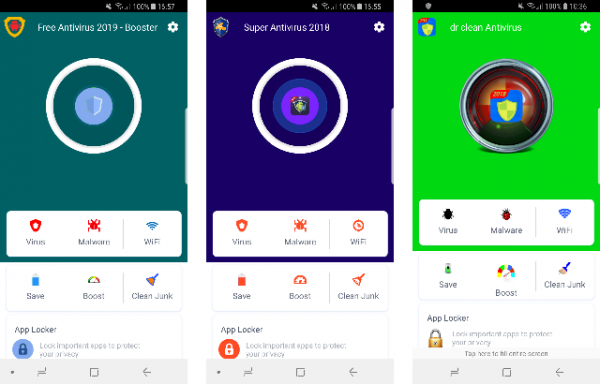 What they found is that many of the supposed antivirus apps simply marked every other app on the user’s phone as suspicious unless it was on a hard-coded list of allowed apps. Some apps displayed a progress bar during a “scan,” but that was just based on a predefined delay for however many files were on the phone. A few of the apps even detected themselves as risky since the developers forgot to add their own name to the app’s list of allowed apps. There was also rampant plagiarism among the less-legitimate apps. Many just used the antivirus engine from other reputable application, despite still charging for their own app. Some of the apps went as far as copying the interface of the legitimate app as shown below. It can sometimes be difficult to determine which apps are real since shady developers can purchase comments and ratings. Update frequency or number of downloads isn’t the best indicator either. AV-Comparatives recommends sticking with well-known brands since the watered-down free version of a real app is better than any scam app. Among the recognizable names that did well were Avast, AVG, Avira, Bitdefender, BullGuard, Emsisoft, ESET, F-Secure, Kaspersky Lab, McAfee, Sophos, STOPzilla, Symantec, Tencent, Trend Micro, VIPRE, Lookout, Malwarebytes, CheckPoint, Webroot and Zemana. Check out the report (below) for the full list. We are also surprised about the amount of bogus “security” software that is being distributed on Google Play with no intervention whatsoever from the platform. We also have to assume the owners of the AV apps that are legitimate, whose work is scrapped by others, have tried at some point to correct this wrong but app stores in general are really hard to deal with, hence the large number of crappy apps waiting to be discovered. Google eventually removes most of them, but not before thousands of users download them. AV-Comparatives’ 2017 test of Android antivirus products was inspired by the discovery of an Android app called Virus Shield, which claimed to scan mobile devices for malware, but in fact did nothing of the sort. In reality, running the app simply showed a progress bar, supposed to represent scan progress, followed by an announcement at the end of the “scan” that the device was free of malicious apps. Worryingly, the app had been available on the Google Play Store, and thousands of users had paid money for it (although this was ultimately refunded to them by Google). Last year’s test showed that in addition to several apps that are equally ineffective at protecting the device against malware, there are other apps that employ dubious detection mechanisms. These detect most other installed apps as potentially harmful, excluding only those with white-listed package names. With user interfaces seemingly generated from a few templates, the main purpose of these apps seems to be generating easy revenue for their developers – rather than actually protecting their users. Including these dubious apps, we found the malware protection of almost 40% of the tested Android AV apps to be inappropriate. 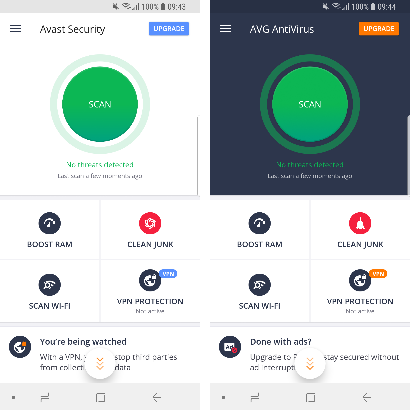 To help owners of Android devices to distinguish between genuine, effective Android antivirus apps on the one hand, and dubious/ineffective ones on the other, AV-Comparatives have again tested the effectiveness of antimalware programs for Android, in the 2019 Android Test. For this test, we searched for and downloaded 250 antimalware security apps by various different developers from the Google Play Store. The antimalware apps from the following 138 vendors detected less than 30% of the Android malware samples, or had a relatively high false alarm rate on popular clean files from the Google Play Store: 1Machine System Sdn Bhd, actionappsgamesstudio, Amantechnoapps, AMIGOS KEY, Amnpardaz Soft, AndroHelm Security, ANTI VIRUS Security, Antivirus Mobile Lab, antivirus security, appflozen, appsshow, Appzila, Arcane Security Solutions, AS team security phone Lab, asuizksidev, Ayogames, AZ Super Tools, azemoji studio, Baboon Antivirus, bESapp, Best Battery Apps, Best HD Wallpapers APPS, Best Tools Pro, BestOne, Bit Inception, BKAV, Bom Bom, Booster studio Laboratory Inc., brouno, Bulletproof AV, Caltonfuny Antivirus Phone, Cheetah Mobile, CHOMAR, Chromia, Cloud 7 Services, Core Antivirus Lab, CPCORP TEAM: Photo blur & photo blender, CreativeStudioApps, CY Security, Defenx, DefineSoft, DreamBig Studios, DU Master, electro dev, Erus IT Private Limited, Falcon Security Lab, Fast n Clean, fluer-apps.com, Formation App, Free Apps Drive, FrouZa, Galaxy TEAM, GameXpZeroo, GlobalsApps, gndnSoftware, GOMO Apps, GoNext App Developers, Gridinsoft, LLC, handy tools apps, Hello Security, Immune Smart, INCA Internet, infiniteWays007, Islamic Basic Education, Itus Mobile Security, JESKO, jixic, Kolony Cleaner, Koodous Mobile, lempea, LINE, LIONMOBI, Live multi Player Game, Main Source 365 Tech, Mama Studio, MAN Studio, Marsolis Tech, Max Antivirus Lab, Max Mobi Secure, MaxVV, Mob Utilities, Mobile Tools Plus, Mobtari, Mond Corey, M-Secure, MSolutions, MSYSOFT APPS, My Android Antivirus, NCN-NetConsulting, Nepelion Camp, Nisi Jsc, Niulaty, NP Mobile Security, NPC Studios, Omha, Oxic Studio, Pix2Pic Studio, playyourapp, Pro Tool Apps, prote apps, Protector & Security for Mobile, Puce, Radial Apps 2018, RedBeard, Secure Cloud, SecureBrain2, Security and Antivirus for Android solutions, Security Apps Team, Security Defend, SECURITY LAB, Security Systems Lab, SecurityApplock, Sept Max, ShieldApps, SjaellSoft, SkyMobileTeam, Smart Battery Solution & Creative Screen Lock, smarteazyapps, Software Center, Soft War, stmdefender, Systweak Software, TAIGA SYSTEM, Tokyo Tokyo, Tools dev, tools for android, Utilitarian Tools, Vainfotech, VHSTUDIO, Vikrant Waghmode, Virinchi Software, Virtues Media & Application, VSAR, Wingle Apps, Xtechnoz Apps, XZ Game, Z Team Pro. We consider those apps to be risky, that is to say, ineffective or unreliable. In some cases the apps are simply buggy, e.g. because they have poorly implemented a third-party engine. Others detect only a handful of very old Android malware samples, and allow any apps that contain certain strings, making them likely to pass some quick checks and thus be accepted by the app stores. A number of the above apps have in the meantime already been detected either as Trojans, dubious/fake AVs, or at least as “potentially unwanted applications” (PUA) by several reputable mobile security apps. It is to be expected that Google will remove most of them from the Google Play Store in the coming months (and hopefully enhance their verification checks, thus blocking other such apps from the store). We would recommend the vendors concerned to remove their apps from the store until they can provide genuine and reliable protection. 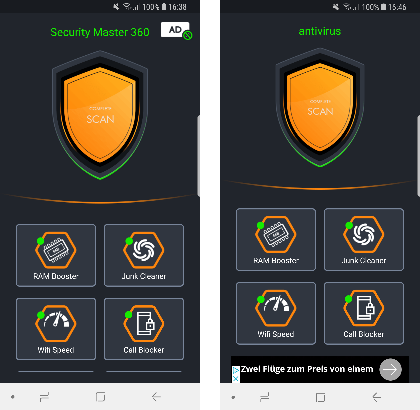 The antimalware apps of the following 32 vendors have in the last two months been removed from the Play Store: antisecurity.inc, AppLocker Cleaner Booster, AppsNewLook, AVC Security, Bastiv, Big Fun Free Apps, Birina Industries, Cooler Technologies, Document Viewer 2019, Erus IT, GearMedia, Himlamo, koala security studio, LA Antivirus Lab, Mobile Antivirus Lab, Mobile Tools, NCK Corp, Ocean Developers, PICOO Design, Protection & Security for Mobile Lab, Rivalab, Secure Performance Dev, Smart bapp, Taobao, Top Maxi Group, TrustPort, Vasa Pvt, Vasonomics, Vitekco, wallpaperdus, Weather Radar Forecast, and zeeworkers. The Android security solutions tested were checked for their efficacy in protecting against the 2,000 most common Android malware threats of 2018. Manually testing 250 security products against 2,000 malicious apps is not practicable. Because of this, the test was run on our automated Android testing framework. Even though the testing process is automated, the framework realistically simulates real-world conditions. This includes testing on physical Android devices (as opposed to emulators), as well as simulation of realistic device usage patterns. The framework consists of two components: a client app on each of the test devices, and a server application. The client app monitors the status of the device and sends its findings to the server at the end of a test case, to document the testing process. The client monitors file and process changes, newly installed apps and their permissions, as well as reactions of the installed security software to malicious activities on the device. The server remotely controls the test devices via WiFi and organizes the results received by the client applications. The system scales well with the number of connected clients. This allows a large number of security products to be tested in parallel. To ensure even chances for all participating products, connected clients can be synchronized to start the execution of a test case at the same time. This is especially important for testing recent malware samples, which security vendors may not have encountered yet. The test was performed in January 2019, mostly on Samsung Galaxy S9 devices running Android 8.0 (“Oreo”). As some security apps did not work properly on Android 8.0, those apps were tested on Nexus 5 devices running Android 6.01 instead (see page 17 for details). Each security app was installed on a separate physical test device. Before the test was started, the software testbed on all test devices – Android itself, stock Android apps, plus testing-specific third-party apps – was updated. After this, automatic updates were switched off, thus freezing the state of the test system. Next, the security apps to be tested were installed and started on their respective devices, updated to the latest version where applicable, and the malware definitions brought fully up to date. If any security application encouraged the user to perform certain actions to secure the device, such as running an initial scan, these actions were performed. If the application offered to activate additional protection functions such as on-install scanning, cloud protection, or detection of Potentially Unwanted Applications (PUA), these features were activated as well. To ensure that all security products could access their respective cloud analysis services, each device was connected to the Internet via a WiFi connection. Once these steps were taken, a clean snapshot of each device’s storage was created, and the test was started. After each of the above steps, the installed security application was granted enough time to analyze the malicious sample and notify the user of malicious activity on the device. If, at any point during the execution of a test case, the installed antivirus application detected and blocked the malicious sample, the sample was considered “detected” and the test case was concluded. At the end of each test case, the device was reset to a clean state. If the malicious sample had not been executed on the device, the sample was uninstalled and/or deleted from the device storage. If the malicious sample had been run, the clean device snapshot was restored before starting the next test case. When calculating the protection score for each product, we did not consider at which stage a malware sample was blocked, i.e. whether it was blocked on download, on installation or on execution. The only factor influencing the protection rate is whether the security solution protected the device from being compromised by the malicious sample. A basic false-alarm test was done, just to check that none of the antimalware products “protects” the system by simply identifying all apps as malicious. Several low-quality apps detected as malware a number of the 100 clean and popular apps from the Google Play Store. For this test, the 2,000 most common Android malware threats of 2018 were used. With such samples, detection rates of between 90% and 100% should be easily achieved by genuine and effective antimalware apps. In total, over 500,000 test runs were performed for this report. Anti-malware apps detecting under 30% of the 2,000 malicious Android apps are not listed in the chart above – partly for display reasons, but also because we consider them ineffective/unsafe. Some products make use of other vendors’ engines (see examples below). While some score the same as the engine vendor’s own product, some do not. According to the licensing developers, this may be caused by several factors, such as different internal settings used by the third-party apps, the use of older engines or different secondary engines, engine implementation and bugs. The apps made by APUS Group, Asuizksidev, Bit Inception, CAP Lab, Clean Boost+ Studio, Fotoable, Hyper Speed, IOBit, LBE, ONE App, Phone Clean Apps, Power Tools Apps, Smooth Apps Studio Super Cleaner Studio, Super Security Studio, We Make It Appen use the Antiy OpenAVL scan engine. Max Dev Labs uses the Tencent scan engine. Hi Security uses the McAfee scan engine. Brainiacs, BSafe Labs and MyMobile Security use the Ikarus scan engine. MalwareFox, MyData, Watchdog Development use the scan engine of Zemana. Their Apps also look very similar. As mentioned in the Tested Products section, some apps were not included in the results table, because we consider them risky. About half of those apps were excluded because of their low malware detection capabilities. The other half blocked many of the malicious samples used in the test, but should in our opinion still be considered risky; in the section below, we explain why we came to this conclusion. The content of the “whiteList.json” file is consistent with the results we found during our false-positive tests: all apps whose package name match this white-list are considered “trusted applications” by these “AV apps”. For example, the whitelisted package name “com.adobe. *”, matches all packages, whose names start with “com.adobe.”. While this entry means that all genuine apps made by Adobe (such as the Acrobat Reader app) will be regarded as safe, this mechanism also allows any malicious app to bypass the security scan, simply by using “com.adobe. *” as its package name. Apart from the apps on their respective whitelists, the risky “AV apps” block almost all other apps, regardless of whether they were installed from the official Google Play Store or not. Some of them do not even bother to add their own packages to their whitelists, causing them to report their own app. If using such an AV app, users can never be sure if any of the other apps on their device are actually malicious, because of the AV app’s “block unless whitelisted” policy. Therefore, we do not consider the protection capabilities of these apps to be appropriate. We consider the above apps made by the following 61 developers to be risky: 1Machine System Sdn Bhd, actionappsgamesstudio, Antivirus Mobile Lab, appflozen, AppLocker Cleaner Booster, AppsNewLook, appsshow, AS team security phone Lab, AVC Security Joint Stock Company, Ayogames, azemoji studio, bESapp, Best Battery Apps, brouno, Caltonfuny Antivirus Phone, Chromia, Core Antivirus Lab, CPCORP TEAM, CreativeStudioApps, electro dev, Fast n Clean, FrouZa, GameXpZeroo, GlobalsApps, handy tools apps, jixic, lempea, MAN Studio, Marsolis Tech, MaxVV, Mobile Antivirus Lab, Mobtari, Mond Corey, Mondev44, MSolutions, MSYSOFT APPS, My Android Antivirus, Niulaty, NPC Studios, Ocean Developers, Omha, Oxic Studio, Pix2Pic Studio, playyourapp, prote apps, Protector & Security for Mobile, Radial Apps 2018, Security and Antivirus for Android solutions, Security Apps Team, SecurityApplock, Smart bapp, Smart Battery Solution & Creative Screen Lock, stmdefender, Tokyo Tokyo, Tools dev, tools for android, Utilitarian Tools, Virtues Media & Applications, Wingle Apps, XZ Game, and zeeworkers. Starting with version 8 (“Oreo”), Android enforces stricter limits on apps that run in the background. According to the official change logs, this was implemented to prevent excessive usage of device resources, such as RAM. The update also made changes that require apps designed for Android Oreo to change the way they react to system events sent by the operating system (“implicit Broadcasts”). This change also affects the real-time protection feature of Android AV apps, since they rely on receiving one of these system events. AV apps use the “Package Added” Broadcast to check and scan newly installed apps. The following developers did not migrate their app to Android Oreo properly: AZ Tools, CHOMAR, Defenx, GOMO Apps, IObit, eScan, PSafe, REVE Antivirus, supermobilesafe, Systweak, TG Soft, Trustlook, Trustwave, Vainfotech, VHSTUDIO, Z Team Pro. Initially (in January and February), the Qihoo 360 app also contained this bug. At the time of publishing this report (in March) however, they have already fixed the problem. The bug does not affect the protection capabilities of the on-demand scans of these apps. Since our test mostly focuses on real-time detections, however, we decided to test these apps on Android 6 instead. Some of the Android security products in our test blocked so few of the malware samples– in some cases literally none – that they cannot reasonably be described as anti-malware apps. Compared to last year, we found even more apps using only black/whitelists as a detection mechanism. In fact, even though we tested 46 additional apps this year, the number of apps which we consider “usable” has stayed the same. 55% of the tested apps offered insufficient malware protection. Furthermore, we also found 16 apps that have not been migrated to Android 8 properly, decreasing their protection capabilities on newer Android versions. 23 of the products we tested detected 100% of the malware samples; considering that the most common malicious Android apps of 2018 were used, this is what they should do. Most of the vendors that usually take part in independent tests score highly, as their products are regularly scrutinised, and they actively develop them to ensure they are effective. When it comes to choosing an Android security app, we recommend considering the following factors. Using user ratings is clearly not effective, as the vast majority of users will give their rating based solely on the user experience, without having any idea as to whether the app offers effective protection. Some other reviews will have been faked by developers. Most of the 250 apps we looked at had a review score of 4 or higher on the Google Play Store. Similarly, the number of downloads can only be a very rough guide; a successful scam app may be downloaded many times before it is found to be a scam. A recent “last updated” date also does not seem to be a good quality indicator, as many low-scoring apps had relatively recent updates. This publication is Copyright © 2019 by AV-Comparatives ®. Any use of the results, etc. in whole or in part, is ONLY permitted after the explicit written agreement of the management board of AV-Comparatives prior to any publication. AV-Comparatives and its testers cannot be held liable for any damage or loss, which might occur as result of, or in connection with, the use of the information provided in this paper. We take every possible care to ensure the correctness of the basic data, but a liability for the correctness of the test results cannot be taken by any representative of AV-Comparatives. We do not give any guarantee of the correctness, completeness, or suitability for a specific purpose of any of the information/content provided at any given time. No one else involved in creating, producing or delivering test results shall be liable for any indirect, special or consequential damage, or loss of profits, arising out of, or related to, the use or inability to use, the services provided by the website, test documents or any related data.